Themes explored by African women filmmakers often fall under the rubric of consciousness-raising; specific topics intended for the general population or women specifically, with the express purpose of building awareness. In these instances, women filmmakers continue the role that African women in grassroots and non-governmental organizations for development have occupied for a long time. 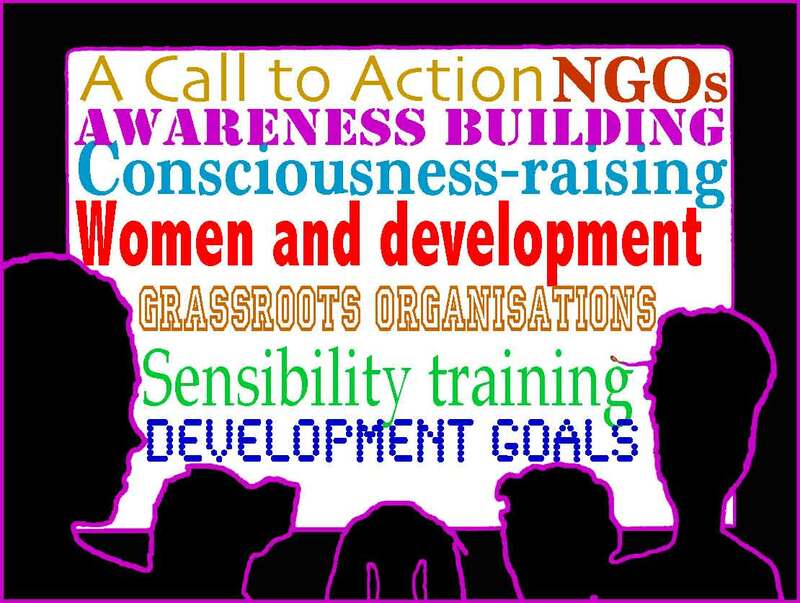 In many cases, international organizations and development groups promote and finance films to develop social consciousness. Moreover, the United Nations has a long history of building awareness on international and local issues by a call to action, by formally observing a relevant theme. The observance of an “International Day” theme was first made in 1950, “International Week” since 1978, “International Year” since 1959 and the first “International Decade” in 1961. Perhaps one of the most memorable decade observances was “The United Nations Decade for Woman," 1976 to 1985. The Decade ushered in an unprecedented visibility on women around the globe, and notably, African women, when in 1985 during the closing year, the conference was held in Nairobi, Kenya. As early as the late 1970s, even while there were few African women filmmakers, their focus coincided with United Nations themes, and in many cases their films were commissioned and funded by international organizations. Kenyan Jane Murago-Munene's first production, The Tender One, was produced during the first United Nation’s International Year of the Child in 1979. It was this UN project that made her realize her interest in documentaries as they “give you a chance to tell things as they are and a chance to go deeper into issues than you would otherwise do”. Pioneer Safi Faye of Senegal directed Les ames au soleil (Souls Under the Sun). Produced by the United Nations in 1980, the film focuses on health and education. Selbe et tant d'autres (One and So Many Others) made in 1982, centers on the daily village experiences of Selbe, which are shared by many of her neighbors, as she is left to care for the household as her husband works in the city. The film was produced by UNICEF under the series title: "As Women See It". It is no coincidence that a surge of African women filmmakers is visible during this decade, many of the films focusing on issues relating to women. This visibility continued into the 1990s. As with the three conferences on women held during the Women’s Decade, the high-profile Beijing +10, the 1995 UN Fourth World Conference on Women and the parallel NGO forum attracted a large global gathering of women. Burkinabé filmmakers Martine Condé Ilboudo’s and Valérie Kaboré produced films focusing on the conference, Messages de femmes, messages pour Beijing and Voix unique...Pour Beijing, respectively. Despite the rapidly approaching desert, women have developed initiatives to fight against desertification and to survive it. The film Femmes de Yatanga focuses on their activities. For example, we see them using a new method of rearing sheep. They learn to fatten the sheep in a more intensified manner than the traditional practices in Burkina, which use a more extensive feeding system. They also use an anti-erosion method to fight against land erosion. We also see how they employ a technique for germination when there is not sufficient rain. In the documentary, I was able to show the women using these techniques. In 2000 the UN Millennium Declaration was adopted by 191 member states of the United Nations in an unprecedented global consensus. Eight Millennium Development Goals were prioritized: 1) Eradicate extreme poverty and hunger; 2) Achieve universal primary education; 3) Promote gender equality and empower women; 4) Reduce child mortality; 5) Improve maternal health; 6) Combat HIV/AIDS, malaria and other infectious diseases; 7) Ensure environmental sustainability; 8) Develop a global partnership for development. Burkinabe Valérie Kaboré received the Millennium Development Goal MDG3 Champion Torch in 2008 for her commitment to achieving gender equity. MDG3 is the acronym for the third Millennium Development Goal. The MDG3 Champion Torch initiative is an important part of Denmark’s Call to Action towards achieving the Millennium Development Goal as it relates to promoting gender equality and empowering women. Exemplary representatives of governments, the private sector, civil society, the media, individuals from North and South, and international organizations are recognized for their efforts toward the MDG3 and for their commitment to “doing something extra” in support of gender equality and women’s empowerment. I think, generally speaking, that African women have much to bring to the development of our continent. It is for this reason that we fight more and more so that women may be trained and educated and have at least a minimum amount of instruction. Because to put a woman in school is to teach her how to open the door to life. Even if she does not go to school for a long period of time, she can at least acquire a minimum amount of knowledge to be able to manage her household and communicate values to her children for their future. In general, the development of Africa depends on what we will do for women of our generation and those of the future. Themes focusing on Women and Health and Culture and the Law as it relates to religious and political fundamentalism proved to be controversial when Zara Mahamat Yacoub, director/producer for the national television of Chad, focused on the the physical and psychological manifestations of female excision in her docu-drama, Dilemme au féminin, (Feminine Dilemma, 1994). Zacoub emphasizes the importance of her role as communicator to reveal practices that she views as harmful; as well as to bring forth the issue toward societal awareness, in an attempt to provide a balanced debate on the various perspectives as it relates to the practice. My latest film is Les enfants de la guerre, or what I call "in the oubliette," because the surviving children are the forgotten ones. It is a film that speaks about the traumatism that haunts children who have lived through war. My film does not only reflect the reality of Chad; it also speaks about the children of today, whether they live in Rwanda, Burundi, or Liberia. It speaks of all the situations where there has been war. What moved me to address this problem in my film is the need to record this phenomenon. Because today when there is a war in a particular part of the world, all eyes are riveted on the country where it takes place. The whole world precipitates to this location; the press, the humanitarian organizations. The world is focused on this country, on the children and women who die. As soon as the war is over, there is not a word spoken about this place and the aftermath of the war. No one even attempts to find out what happened to the survivors.In a war, it's true there are the dead, but afterwards there are certainly those who escaped, who survived. But no one searches to know how those who remain are continuing to live. In my film, I bring out the trauma suffered by the children who were left on their own, who are still there living with family members, in orphanages or in the streets. They continue to be haunted by images of the war. However, there is no one who stays behind in an attempt to care in some way or another for these children. These children, whether we admit it or not, are sick. They are sick from all that they have lived through during and after the war. Thus, the reason for my film, Les enfants de la guerre. In Nairobi, I wrote and directed a film based on the right to attend school plus the right to know both parents. The leading character, Koi, cannot go to school because her mother is only a street hawker and is also single. Koi, inspired by "The Ghost of Children's Rights," tracks down her father and literally blackmails him into paying her school fees. So she kills two birds with one stone. The twelve-minute story is a comedy of sorts. The second film was shot in Kigali and is based on traumatized children. Gatashya, a ten-year-old boy, lost his whole family in the genocide but survived somehow. He meets another orphan boy in the city who introduces him to his orphanage. The personnel at the orphanage try to help him to work out his trauma and get over it. I asked her to elaborate on the story of Gatashya to which she replied. …During the 1994 genocide in Rwanda, Tutsis were killed by the hundreds of thousands. Hutu sympathizers were also killed. The genocide did not spare neighbors or close relatives who had got mixed up in the ethnic division. Hundreds of children were orphaned. No one in Rwanda was spared, because many are still traumatized. The survivors all lost many of their kin and friends. A trauma psychologist who works with children told me stories about children watching their fathers and mothers getting chopped up. It is unimaginable! After doing some research, I decided to do the short film on this subject— which is actually too hard for children, but it happened to children! I found it difficult to make a film…which is palatable to children who have not gone through this. But even then, it is still terrible. Maki'la (2018) by Machérie Ekwa Bahango explores the theme of street children through experiences of two adolescent girls. In her feature fiction film she wanted to show the friendship, dreams and love as well as poverty and hardships of the streets. On 1 December, the United Nations observes World AIDS Day. It is worth noting filmmakers such as Burkinabé Fanta Nacro who has been at the forefront in using cinema to address the AIDS crisis in Africa, which include the documentary films, En parler ça aide (2002); Vivre positivement (2003) and Never Alone, A Call to Action, No Time to Drop Your Guard, From the Young People Against AIDS: Scenarios from Africa (2003-2004). Le Truc de Konate (Konate's Thing, 1998), a humorous short fiction film by Nacro was very popular with the audiences in Burkina Faso. The film blends traditional skepticism of new ideas, masculine virility and honor, and emerging female consciousness. On a more somber note Tsitsi Dangaremba's feature film Everyone's Child (1995) deals with the daunting consequences for the children who are left to fend for themselves when their parents die from the devastating affects of AIDS. Kenyan Wajuhi Kamau, who works in the Film Production Department of the Educational Media Service of the Minister of Education, emphasizes the effectiveness of video as a means of educating people about issues from AIDS to family planning. Using both the documentary and drama presentations, the objective of the Educational Media Service is to take the results to the people who then see themselves reflected in the images, "when you see yourself, you see your situation, then it is easy to remember and change attitudes and behavior." Zimbabwean Prudence Uriri focuses on issues related to AIDS and health in general. In her role as filmmaker, she sees the importance of opening a dialogue about the problems that people face so that they may be better informed of the situation. In 2019, for the 50th anniversary of the iconic Fespaco, the Pan African Film Festival of Ouagadougou in Burkina Faso, UNESCO put the spotlight on women and policies supporting the film sector in Africa during. A high level round table entitled "50 years of FESPACO: 50-50 for women" was held with the participation of the Director-General of UNESCO, Audrey Azoulay, and Madame Sika Kaboré, First Lady of Burkina Faso. The purpose of the roundtable was to bring together women filmmakers, film distributors, as well as ministers of culture from West Africa to discuss the challenges women face in accessing funding and training opportunities in the film and broadcasting industries in Africa. It also examined the issue of gender equality in national cultural policies and the representation of women in decision-making positions. Parts of this text have been extracted from "Visualizing Herstories: An Introduction to African Women Cinema Studies"
--by Beti Ellerson. Updated March 2019.